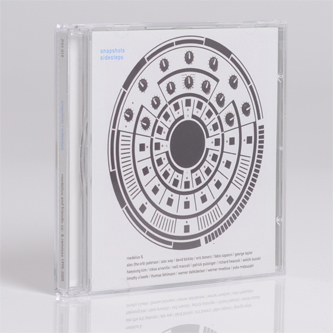 Psychonavigation Records collects the work of Roedelius disseminated through remixes by Patrick Pulsinger, The Orb, Alec Way, Haeyoung Kim, Werner Moebius and more on 'Snapshots Sidesteps'. Essentially all the reworks come from a generation inspired by Hans Joachim Roedelius's foundational work with Kluster/Cluster at the core of Krautrock's golden years. The genres of ambient, glitch and electronic dub which these artists inhabit wouldn't be the same without his early contributions, hence each artist treats the material with a certain air of respect, attempting to reflect the elegance and beauty of his work. They range from the rarified cosmic isolation of Patrick Pulsinger and Werner Moebius's electro-acoustic treatments on 'Clair Obscure' to the fragile ecology of sonorities in Haeyoung Kim and Nikos Arvanitis' 'Dynamo' through haunted dub in the hands of The Orb's Thomas Fehlmann and Alex Patterson, to the clustered shards of glitch texture wrapped to mottled piano samples on 'Fait Accompli', again with Werner Moebius.